Renewable Energy Group announced plans Nov. 1 to spend $24 million expanding production capacity at its first biodiesel plant, the 12 MMgy Ralston, Iowa, facility built in 2001. The expansion would more than double capacity at the plant to 30 MMgy. The U.S. EPA has announced plans to hold a public hearing Dec. 6 in Chicago, at the Palmer House Hilton Hotel, for its proposed Renewables Enhancement and Growth Support Rule. Those who wish to testify must contact the EPA by Nov. 22. Peru announced Oct. 26 its imposition of antidumping duties on Argentine biodiesel, citing important domestic industry damage from cheap imported product. The duties range from roughly 41 to 64 cents per gallon, depending on the exporting company. The National Biodiesel Board has named Donnell Rehagen as the trade group's chief executive. Rehagen was named interim CEO in June after serving 12 years as NBB's chief operating officer. Several industry stakeholders comment on his new role. For better or worse, the U.S. biodiesel industry continues to consolidate. While 2014-'15 has been a rough period in the sector, the fallout has presented undeniable opportunities for key players with strong balance sheets and keen business acumen. REG developed, produced and delivered approximately 1 metric ton of the renewable, multifunctional specialty fatty acid to Aroma Chemical Services International, a leading specialty manufacturer and supplier of flavor and fragrance ingredients. Nearly 394.88 million D4 biomass-based diesel RINs were generated in September, bringing the net total for the first three quarters of the year to 2.75 billion. The majority, 2.23 billion, were generated for biodiesel, according to EPA's EMTS data. BDI-BioEnergy International's RetroFit technology is behind the upgrades and expansion at Crimson Renewable Energy's Bakersfield, California, biodiesel plant, which held an unveiling ceremony showcasing the facility's new capabilities this month. South Hadley, Massachusetts-based heating oil and propane delivery company Fuel Services Inc. has begun to offer what it calls B5 UltraClean, a blend of ultra-low sulfur heating oil, 5 percent biodiesel and UltraGuard Advanced Fuel Treatment. South Portland, Maine, has begun a pilot project in which select city vehicles will run B20 for a full year to test the efficacy of the fuel in all conditions. The city has partnered with Maine Standard Biofuels, a small, local biodiesel producer. The city of San Diego has recently started using Neste renewable diesel in its vehicle fleet. More than 1,100 vehicles and equipment, representing approximately 25 percent of the city's fleet, run on Neste renewable diesel with no reported issues. U.S. EPA delivered its proposed rule to set renewable fuel standard volumes for 2017 and biomass-based diesel volumes for 2018 to the White House Office of Management and Budget Oct. 19. OMB review marks a last step before a final rule is issued. On Oct. 21, Nixon's office announced the release of $3 million to pay down the $9.6 million currently owed to Missouri farmers who invested in the renewable fuel a decade or more ago through the Missouri Qualified Biodiesel Producer Incentive Fund. The National Biodiesel Board sent a letter to House and Senate tax committee leaders urging extension of the biodiesel tax incentive before it expires Dec. 31. 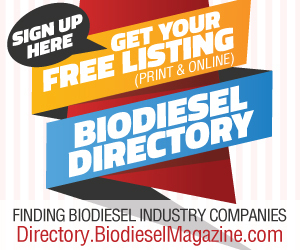 The letter was sent on behalf of U.S. biodiesel producers nationwide.